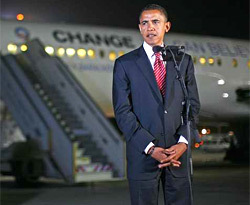 The first word painted on the side of the private jet that brought Obama into Ben Gurion airport last night was: CHANGE. Yes, Obama as the candidate of change — that is what much of the world hopes for. Disclaimer: the title of this post was written before I even saw this Jerusalem Post article on Obama’s media caravan/circus: “Barack Obama is in town, along with hundreds of media personnel. Approximately 50 visiting journalists, most of the 400 foreign correspondents based in Israel, and the three anchors from the top US media networks will be following Obama through his day-and-a-half visit to the Holy Land as part of a longer trip to Europe and the Middle East. Katie Couric of CBS, Charles Gibson of ABC and Brian Williams of NBC have been promised exclusive, personal interviews with the presidential candidate. NBC, ABC and CBS evening newscasts are originating from stops along the route and will undoubtedly give it big play”. The full JPost article can be read here . I’m heading off to Ramallah now to cover this part of the tour. UPDATE : I am informed at 11:30 that it is too late to enter the Muqata’a – the Palestinian Presidential Compound — in Ramallah to cover Obama, who will only arrive for a meeting at 13:30, two hours later, If there is to be any press conference – which is initially said not to be on the schedule, but may happen anyway — it will not be before 14:30. In other words, three hours later. Journalists are supposed to show up THREE HOURS before a scheduled event! The Information Chief in the Muqata’a said he was so sorry, but the dogs – DOGS – and magnetic doors have already been taken away. Journalists and their equipment (mine is a notebook of paper) must be sniffed by DOGS! Who is responsible for these security arrangements, I asked???? Before I was always told by the Muqata’a staff that it is the Americans. But U.S. Secretary of State Condoleezza Rice has given instructions that American Embassies and Consulates are not to be involved in the visits of presidential candiatess – which I mentioned to the Information Chief. Oh, he said this time, it is our security and the Americans. UPDATE on Friday 25 July 2008: Angry Arab (Professor As’ad AbuKhallil) is reporting on his blog that “Obama was scheduled to have lunch with … Abu Mazen and Salam Fayyad, but that Obama changed his mind and decided to have lunch with his Israeli friends instead although the dishes were prepared”. Note to self: avoid any such events during Ramadan (which this year will be the whole month of September). Next Next post: "Israel keen to crack down on East Jerusalem"